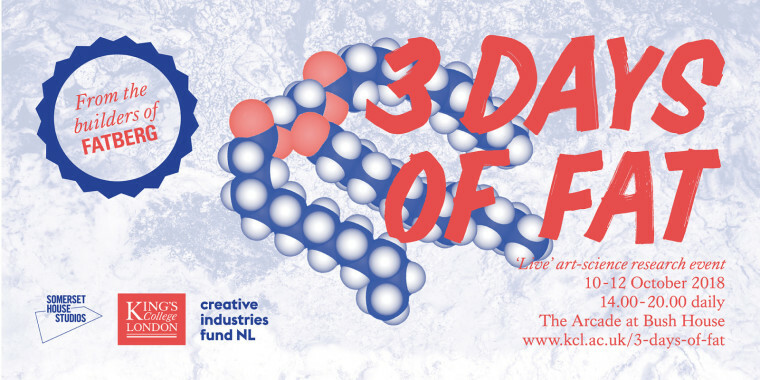 We are pleased to announce ’3 Days of Fat’ – a ‘live’ art-science event focused on the construction of an island of fat – a ‘fatberg’. The event, a series of themed experiments, performances and discussions brings artists Thought Collider and Arne Hendriks together with King’s College London’s Department of Nutritional Sciences and experts from art and culture, life sciences, food, agriculture and healthcare to discuss humanity’s complex relationship with fat, what it is and what it might become. Wed 10 Oct: ‘Life & Ecology’ with Natsai Audrey Chieza, founder of bio design lab Faber Futures; Professor Snezhka Oliferenko, Group Leader of Comparative Biology of Mitotic Division Lab, The Francis Crick Institute and Randall Centre for Cell & Molecular Biophysics, King’s College London; and, Dr Jeremy Carlton, Group Leader of Organelle Dynamics Laboratory, The Francis Crick Institute. Thu 11 Oct: ‘Health & Beauty’ with Alan Warburton, Somerset House Studios artist; Dr Grace Williams, artist and researcher, The Courtauld Institute of Art; Krysten Resnick, Ori Tahiti / Hawaiian Hula dancer; and, Elisabeth Cresta and Caroline Day from myth-busting duo Fight the Fads. Fri 12 Oct: ‘Energy’ with Lucy Sanderson, Somerset House Studios artist and co-founder of Studio Lucy Sanderson; Thomas Fudge, CEO of WASE; Adrienne E. Treeby, founder of Crown & Queue Meats; and, Professor Mike Michael, Sociologist of Science and Technology at University of Exeter. 3 Days of Fat is supported by King’s College London in partnership with Somerset House Studios, with additional support from Stimuleringsfonds Creatieve Industrie.